Ptolemy was a Greco-Egyptian mathematician, astronomer, geographer, astrologer, and poet. 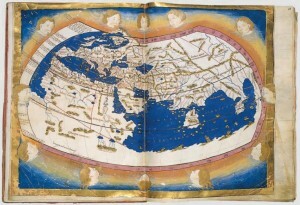 While his maps were largely inaccurate, Ptolemy invented several mapping concepts that are still in use today, including projections and using latitudinal and longitudinal coordinates. His book Geographia was largely influential for many early explorers, including Christopher Columbus who was encouraged by the large, yet incorrect, size of Asia.